Résumé’s (also known as CVs) are great. They sumarize your experiences onto a few pages so your employer can quickly get a sense of who you are before hiring you. However, employers have to go through a lot of résumés in their search for a potential hire, so making a great résumé can result in a good first impression. Traditionally, résumés have been blocky, information-dense pieces of paper that you send out to employers you’re checking out. With the advancements in personal computing, software and printing, people have been more and more creative with how they craft their résumé’s. The more traditional approach can look more professional and neat, but a creative approach can often help you stand out from the crowd. Choose a method that best presents you in a positive light. Before you write down your résumé, sit down and take note of what you’ve done. Any interesting projects taken? Achievements? List it down. Also verify the dates of your education background. It can be easy to forget, especially if you’ve left your academic studies for a long time. Also try and find out the full course or programme names of your certificates, degrees, doctorates. Doing great things lead to a great résumé. Take up as many opportunities as possible that can be put on a résumé, like volunteer work, teaching, skills training, etc. Easy way: Use a predefined template from Word, Pages, or Docs. Tools needed: A PC, tablet, or smartphone. Open the word processor, and select from the list of templates given. You can add, remove, or move around certain sections which do not pertain to you. For example, for a fresh graduate, your education background would come above your work experience because the former is more important at that stage of life. Vice versa for those already working. Want more templates? 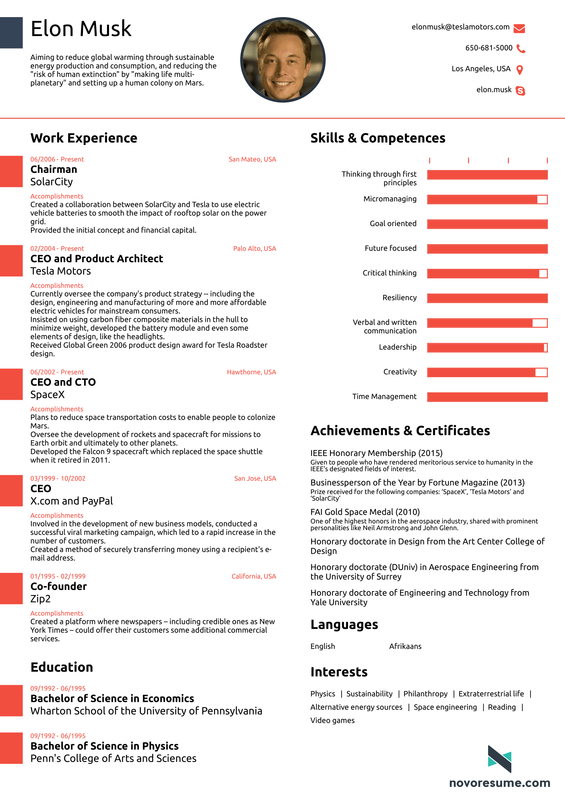 Check out https://résumégenius.com/résumé-templates. Normal way: Build it from scratch. Tools needed: PC, tablet, smartphone. Word editing software needed. Building your résumé from scratch allows you to customize every single aspect of that you can present to your future employer. Start by writing down your info. Be concise, truthful, and accurate. Then add your work experience, or educational background. As previously mentioned, this depends on whether you’re still studying or have already worked. Put it in reverse-chonological order; meaning the latest job first, and the first job last. Same with education. Add in your skills. It helps employers a lot if you could put in the degree of proficiency. To keep it simple, just rate it from 1-5. For example, ANSYS = ⅘ , SolidWorks = ⅗, verbal communication ⅗, and so on. Some skills to add include software (ANSYS, SPSS), or equipment handling (telemetry, ECG, cardiographs). Don’t forget to add in your language ability. When working in sectors like healthcare, where you deal with a diverse set of people (especially in multi-cultural Malaysia!) it helps to be bi- or trilingual. Employers love that. Now that you’ve added all you have to add, start by styling the text appropriately. A good rule to follow is to enlarge each point by a few titles, then bold it, so the reader can quickly skim through your résumé. Ensure there is enough spacing. Think of whitespace as breathing room. You want your text to be able to breathe in order to be legible. A cramped document is not fun to read. Add in the headers and footers. A good use of headers would be your name and contact number, in 9-pt font. Employers often put your résumé in a stack, and putting something to identify you there would help a great deal. You can put a page number on the footer for continuity purposes. View over the entire document. Ensure the margins are properly aligned. Is the font legible? Clear? Then head over to save and print it out. You’re done! With easy application processes from job portals like MIMS Career, employers now are as equally likely to read your résumé in a digital format, on a screen. This allows for some creativity, as current screens can now reproduce millions of colors, in different shapes and sizes. Remember not to overdo a creative design; keep it subtle, keep it clean, and keep the information legible. Easy way: Use an online résumé builder. Tools needed: PC, with keyboard and mouse recommended. An internet connection is important. My favorite résumé builder is, by far, Novorésumé. Very intuitive controls. A good degree of customization available. Their presets are killer design. They’ve matched out complementary colors in each of their templates so you don’t have to. They’re all subtle, yet sophisticated. Clean, yet intricate. It’s also multi-lingual, so you can craft your Bahasa Malaysia résumé in it as well. Have a look at Elon Musk’s résumé, generated by Novorésumé. It’s simple, packed, and most importantly, eye-catching. It already looks superior compared to a lot of the résumés we have seen. It also proves that you don’t need many pages to list down your info, despite being one of the world’s most successful visionaries. There are also other résumé builders online: Reed is one of them. Just do a Google search, you’ll eventually find out with layouts or usability that you really like. The Normal way: Design it yourself! Tools: PC, Keyboard + Mouse, Drawing tablets optional, PhotoShop/Illustrator/Any online sketching tool. To do this, you might need some additional skills with illustration software. The idea is to create a layout that draws attention but doesn’t compromise on information legibility. You can have a look at great designs from dribbble.com, a site where great designers like to post their work. Have a look at the ones you like, and determine what you like about them and incorporate them into your design. It’s good inspiration. Use 15-25px only. A too large text-size can look goofy and awkward. Like a kids book. Use a big font for headlines, and employ a low font weight. Like Helvetica or Lato. Since you’re sending this over the web, and it will be read on screen, go for a sans-serif font for easier legibility. Use only one base color. A résumé with too many colors will make it look amateur and is a pain to see. In the end, your résumé is an official document used to represent you in a good light. Never choose black for your base color. Black never appears in the real world. It is sombre, demure, and lacks energy. It is always a bad idea to use black for anything that is to be displayed on-screen, other than text. Icons can help increase aesthetic features and help you stand out. Use icons that are recognizable, like a suitcase for work experience, a graduation hat for education, etc. I recommend the use of icon fonts. They are scalable at various dpi on-screen. Whitespace is space where there’s no stuff. Use it to define hierarchy by putting some space between your education, work, skills, and information sections. Use that whitespace to build flow for the résumé reader. That’s it! It all depends on how much time and effort you can put in to your résumé. Remember to keep it simple, accurate info, and not too long; 2 pages should be the absolute maximum. You what would be a great use of that résumé? Use it when applying for jobs in Malaysia, Singapore, Philippines, and Indonesia with our job portal, MIMS Career.. A lot of nurses, doctors, and other healthcare practitioners have been using the service, and many of them have landed the jobs at the location they’ve always wanted. Signup and apply now using our 1-click application feature. It’s fast, safe, and free. Any problems? Email us at mycareer@mims.com for more inquiries. Passed Your Malaysian Nursing Board (LJM) Exam? Here's What To Do Next!